Based in and around Cambridgeshire, the English rock group known as The Brink are due to release this, their first full-length release, in just a few weeks. With 2 addition EPs contributing to their back-catalog, and having already shared the stage with the likes of Heaven's Basement and Tigertailz (indeed, the group is well-known for their hardworking style), The Brink are not exactly newcomers to the rock scene in the strictest sense of the word. Even so, The Brink, and everything that makes up their world of good, old-fashioned and damn authentic hard rock/rock and roll, are likely new to US fans. Lead by Tom Quick, who for some reason reminds me of a cross between Green Day's Billie Joe Armstrong and a more "down-the-middle of the road" (and much more mellow) James Hetfield, The Brink features two great guitarists in Lexi Laine and Joey King and a up-beat and perfectly-suited rhythm section in bassist Gary Connor and drummer Dave Forster. Even in their chosen field (new rock and roll with an open-minded, older mindset) things are getting a bit crazy with this past year alone seeing more and more new names entering into the fold. 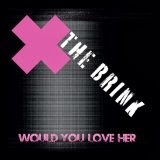 What does The Brink offer on "Would You Love Her" to help them stand out? For one thing, The Brink know how to write catchy material that sticks to listener's ears. This album comes attached with actual, honest to goodness, singles! Crazy huh? Opener "One Night Only", the album's first single, is pure rock and roll bliss as is "I Want It" (with it's smiling nod to Bon Jovi), but the one track that has radio-airplay written all over it is "I Know". With it's somewhat laid-back, 90's vibe this is one track that could and should dominate rock radio as should it's follow-up cut, "Broken Romance". This 5-piece act, which lists it's three biggest influences as Bon Jovi, Skid Row and Aerosmith, bring back the groove of old school rock radio, but they do it with more then enough sweet nuggets of modern rock that one could easily see these guys break-out and in a huge way! The album's mixture of radio rock and rock ballads is a grand adventure in the making. And the thing is The Brink comes across as more of a fresh-faced (and in a good way) hipster act then some new band just recycling old classic rock riffs. Even if it's bands like Bon Jovi, Skid Row, Aerosmith, Whitesnake, Deep Purple, Mötley Crüe, Def Leppard, Led Zeppelin, AC/DC and Jimi Hendrix that has helped define the sound of The Brink are more then adapt at cranking out fresh rock beats. And let's face the music here folks, that is easier said then done. Even when you have youth, energy and tons of enthusiasm on your side that's still not a guarantee recipe for success. With the end of 2013 clearly in sight now, which is just about crazy when you think about it, the one thing that has stood out has been the large comeback of traditional rock/hard rock and traditional heavy metal. adventurous. That means there are more then enough new acts to check out and it can be frustrating trying to find the cream of the crop. Well, The Brink are at the top and looking to keep that title anyway possible I figure. With the powerful appeal of "Would You love Her" (both as an album and as a title cut!) paving the way for this English act I see big things out of The Brink. So, why not jump on board now then before the bandwagon gets overly crowded? Good old fashioned rock n roll. I especially love joey king.